This ski-in ski-out unit is at the very best location on the mountain and is in the heart of one of Montana’s finest ski resorts. Just steps away is the Base Lodge that links you to 3000 acres (98 trails) where you can enjoy some world-class skiing. The resort is well known for a pleasant lack of lift lines as for its consistently good snow conditions, on average 300 inches a year! This unit has 4 floors and 3574 square feet of living space with cathedral ceilings and large windows to enjoy the spectacular views!! The floor plan is open and inviting. Gourmet kitchen has Viking commercial grade appliances and large dining room table with seating for all. The finely-appointed living room has a gas fireplace and comfortable TV area with leather sofa and large flat screen HD TV. Enjoy the large balcony just off the great room to enjoy the fresh mountain air and views! There is one half bathroom on this level. Upper level is for the master suite. The master bedroom has a queen-size bed, gas fireplace and a private balcony with French doors to enjoy the views. Master bedroom also has a master en-suite bathroom with a large luxurious bathtub, tile shower and his and hers sinks. There is a roomy and comfortable bed bunk room that has two (2) Twin over Queen size bunk beds, large HD TV, leather movie chairs and balcony!! Bunk room also has its own en-suite bathroom!! This space is perfect for the kids!! On the lower level are two guest rooms each with queen-size beds, private baths, and private patios. Unit comes with a laundry room with full-size washer and dryer. Two-car garage. You owe it to yourself to stay at this Slopeside unit!! 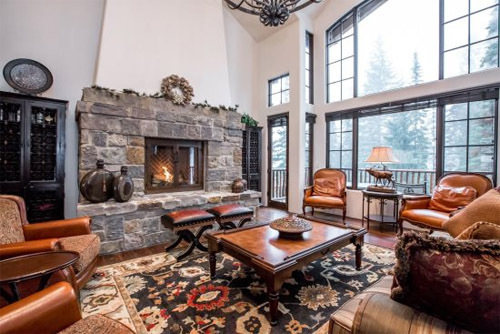 One of the finest luxury condominiums at Whitefish Mountain Resort (formerly known as Big Mountain Resort ). Slopeside won 'Best Development Multiple Units in USA' in the 2012 International Property Awards.